FREDERICTON -- It was about 7 a.m. on Friday when the first shots rang out, shattering the peace and quiet of Lawrence Perrin's morning routine. The 59-year-old walked up the driveway of his apartment building on the north side of Fredericton where he looked across to the building next door and saw the barrel of a long gun sticking out of a third-floor window. Moments later, he heard a woman scream. "I didn't see her, but I heard her screaming," he said Sunday in an interview outside his apartment. "She came out, and you could hear her screaming, and then (I) heard another shot or two go." Two days after the fatal shooting that claimed the lives of two police officers and two civilians in New Brunswick's capital, new details of Friday's rash of violence began to emerge in witness accounts. Only a patch of grass and some bushes stand between the three-storey brick apartment complex where the shooting happened and the modest, U-shaped building occupied by Perrin and his neighbours, including many low-income seniors. On Sunday, after police removed the barricades that were blocking their access to the road, Perrin and two others appeared eager to describe what they'd seen and heard. 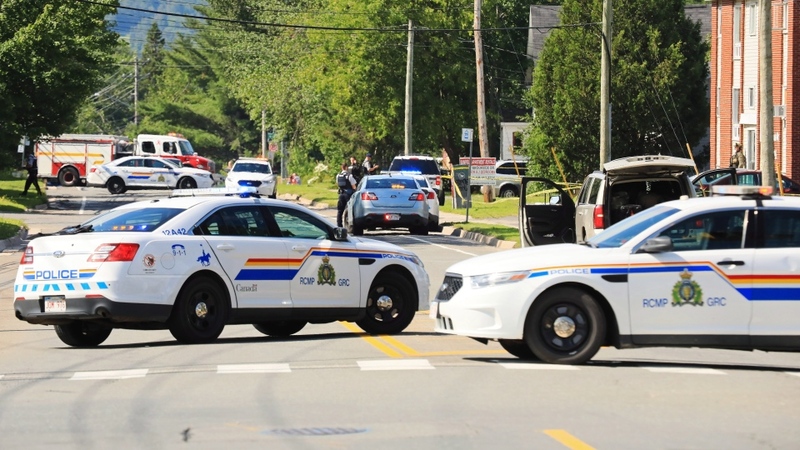 Fredericton police have said two officers responded to reports of a shooting in an apartment complex at about 7:10 a.m. and found two victims on the ground -- a man and woman later identified as Donnie Robichaud and Bobbie Lee Wright. The responding officers, constables Robb Costello and Sara Burns, were shot from "an elevated position" by someone firing a long gun as they responded to the call, Fredericton police Chief Leanne Fitch said Saturday. Carl Dunnett and George Ferris, who watched part of the incident unfold from Dunnett's balcony, said more police officers arrived on the scene several minutes after the initial gunshots. "Once the police showed up, there was quite a bit more gunfire for a little bit," Dunnett said. While they didn't witness Costello or Burns' deaths, in the moments that followed, Perrin and his neighbours said they witnessed a shootout between the suspect and a police officer taking cover around the corner of the building, who Ferris said was "white as a ghost." "He was shooting (up) at the window, then he backed off for a moment, I think he reloaded." Moments later, Ferris heard someone yell, "Keep coming, you'll get 'er next!" followed by swearing. 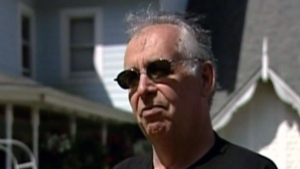 Tim Morehouse, a resident of the neighbourhood, also remembered hearing the shouting. Morehouse recounted last week that he was in his apartment when he heard someone shout: "Shut up! Shut up!" "I hear more shots and looked out and there's two police officers on the ground," he said. "I called 911 and they came and checked on them and they were shot." Caitlyn Francis, who lives in the complex where the shooting occurred, said she heard the first sirens between 7:10 and 7:13 a.m., as she was getting her four-year-old stepson ready for daycare. She looked out and saw a police cruiser pull in, driven by an officer she said she believes was Costello. "Not even a minute or two later, I heard the first gunshot," she told The Canadian Press in an interview Saturday. Even after the initial gunfire, she said the true gravity of the situation only hit her when more police in tactical gear arrived in an armoured vehicle, and she saw them mounting "a big gun" on the roof. "At that point I freaked out," she said. The next moments were a blur, she said, as she focused on keeping her stepson safe and calm as several more shots were fired, she said. "I pulled him into my bedroom, got him to lay on the floor back there, tried to play cartoons for him, but he still could hear (the gunshots)," she said. Meanwhile, dozens of officers dressed in combat gear were converging on the building, where Perrin said they swarmed the lawn in front of his building. "They laid that chair over there with a gun and scope on it," he said, pointing. "No more than 15, 20 minutes later, there was helicopters going all over the place." Francis, hiding in her apartment with her stepson, said the whole thing ended just before 9 a.m., when a police officer knocked on her door and escorted her from the building. A short time later, police announced that they had arrested an injured man inside an apartment. The next day, officials identified the alleged gunman as 48-year-old Matthew Vincent Raymond, who is facing four counts of first-degree murder in the deaths. On Sunday, the scene of the shooting was still barricaded off with yellow police tape, and officers could be seen using a lift to inspect the buildings' eaves and upper windows. While their tree-lined residential neighbourhood is generally quiet, Perrin and his neighbours all said the cluster of buildings next door is visited on a regular basis by police responding to domestic disturbance incidents. "There's lots of yelling and screaming," Ferris said. Perrin said many of his neighbours are still feeling unsettled and jumpy. "You hear a garbage truck come, and it goes 'bang, bang, bang,' and they're out the door," he said.